Former England star Marcus Trescothick has revealed how anxiety attacks have affected him since the age of 10. Trescothick, 32, pulled out of England's 2006-07 Ashes tour with depression and has since confirmed that he will not play for England again. In a candid interview on BBC's Test Match Special, he said: "I always struggled since I was 10, 11 going away from home on school trips. "It continued on cricket trips all the way through until I'd had enough." Trescothick recalled one incident on the Australia tour in Sydney, soon before he pulled out of the series, when he was pursued by a photographer. "I was in despair really. I didn't feel comfortable wherever I went. Whether in my room, downstairs having a drink with the lads or going out into town, I was always looking over my shoulder. "I went to lunch one day in Sydney with Ashley Giles and Geraint Jones and we were followed by a photographer. "Every time we sat down for coffee he was right there taking pictures of me. Little things like that freak you out when you aren't feeling great anyway." The first time Trescothick's problems reared their head publicly was during the 2005-06 tour of India. He returned home suddenly, and after an indifferent summer in 2006 it was announced he would miss the Champions Trophy as he was still recovering from a stress-related illness. He was included in the Ashes squad but lasted less than two weeks before he was boarding a flight back from Australia with a recurrence of his illness. His return to action started with Somerset and his 2007 form, plus England's continued failings in one-day cricket, meant he was recalled to England's preliminary 30-man squad for the ICC World Twenty20. But he failed to make the cut, and, in March 2008, days after withdrawing from Somerset's pre-season tour to the UAE, he announced his retirement from international cricket. 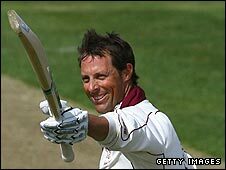 Trescothick has now written an autobiography, Coming Back to Me, due for publication on Monday. And interviewed by BBC cricket correspondent Jonathan Agnew on Sunday, he explained: "I've not brought it out for people to use as a self-help book, to say this is how you cope with anxiety and depression. "It's just to get it out in the open - there have been so many questions left unanswered and I've not helped that process. But this is the opportunity, and I hope people can understand why I did a few things I did." Trescothick gave a series of interviews early in England's Australia tour insisting he felt fine though in truth he was already beginning to feel the problems he was all too familiar with. "I remember those interviews. I wasn't looking forward to them, but I'd dealt with the process for such a long time, you get through those processes. "I didn't want to admit to people it wasn't as good as I wanted it to be because I wanted to make sure I could stay on the tour. "It was just about two days before it started, it really picked up and once it starts it snowballs and every day it gets worse and worse. "The situation I was in, it was just going to get worse. I didn't want to say to people I've missed out again, it was a tough pill to swallow. "The words that I speak, you convince yourself that everything's OK but eventually it cracks and then I knew midway through that match at Sydney I was gone and that was enough. "I struggled mostly with the nerves and the worrying that goes with it. It doesn't matter what you do, anybody can pick it up whether you earn £1m a year or £20 a week. "It strikes when it wants to and there's not much you can do until you take pills or seek help and get back on the road to recovery. "But you try to cope with those pressures. Then, when you get to that point when you are trying to deal with everything, when you are stuck in a hotel in Baroda [India] or Sydney without the support network of your family you realise you don't need to be like that. "When you worry about external stuff in cricket you struggle for runs. If you are not mentally switched on behind the scenes then you've got no chance on the pitch. "People try and hide it all the time. I hid it for weeks, months and a couple of years before saying I don't want to run from this any more." Trescothick said there remained misconceptions about the nature of his condition. "Anxiety problems are seen as a weakness. People tell you to pull yourself together. But it is an illness, it's not something you make up. "The pressure of travelling in the winter is a major pressure, trying to get to Abu Dhabi in the winter [for the Somerset tour earlier this year] was the worst of it. "It's not worth the hassle of making me poorly. But in England I can travel for three weeks away at a time because you know that you are a maximum of three hours away from home. "And after a long hard day at Taunton I can go home and put the kids to bed and that means so much to me." He admitted that coming to Lord's to see England play South Africa on Sunday - his first trip to a major cricket match in years - had left him with mixed feelings. "If I was playing a game here today I'm pretty confident I could do a good job," he said, before insisting he was happy with his decision to quit the international scene. And he said there was no prospect of him signing a deal to play in the lucrative Indian Premier League. "The IPL runs for six weeks and it wouldn't be possible to take the family there," he said. "I wouldn't be prepared to take my little girl there, she's just starting school." He also had an interesting take on Kevin Pietersen's captaincy: "When he first started he definitely didn't strike me as captain material. He didn't look like the character to do that, he just wanted to be the best player we ever had. "But they've started off pretty well and potentially who knows where it can go from here on in."